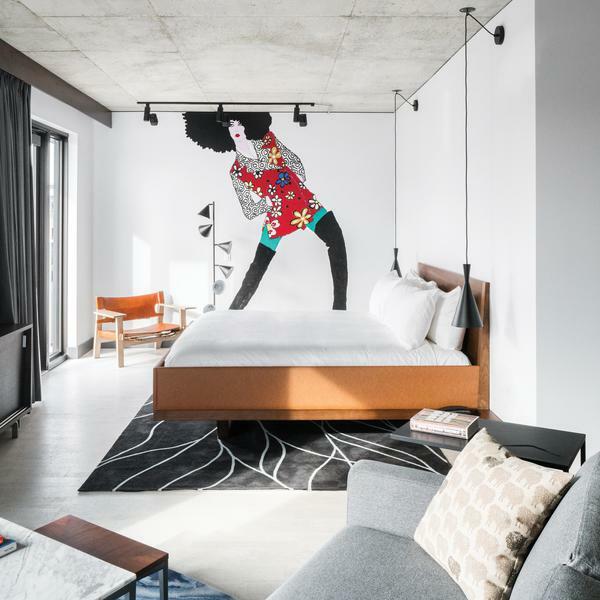 Brintons collaborated with Denver-based architecture and design firm, Johnson Nathan Strohe (JNS) on The Maven Hotel at Dairy Block. 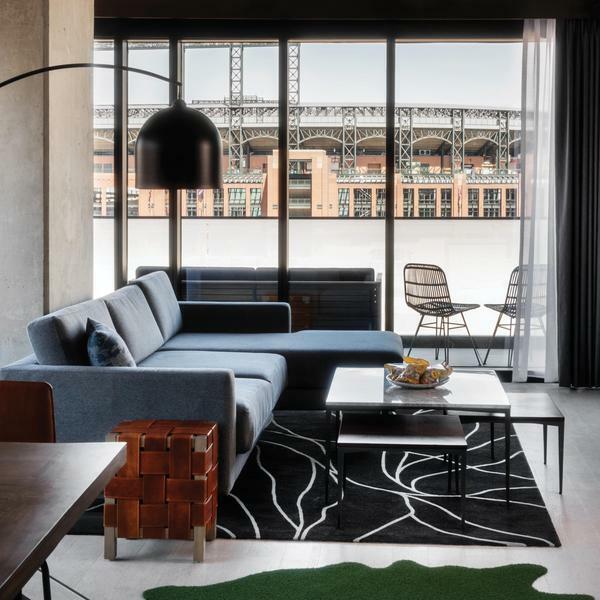 Together, the teams developed 2,300 square yards of custom axminster carpets for the corridors and approximately 1,190 square feet of hand tufted rugs for the hotel's suites. The Maven, located in Denver’s Lower Downtown (LoDo) District, is a nostalgic yet quirky nod to the hands of the makers that created the foundation of this industrial city. Like historic Union Station with daily trains spilling people into the city for work, LoDo today resembles the same influx of makers, artisans, and entrepreneurs that weave the city’s cultural fabric. The industrial inspired interior features raw hard-wearing materials like concrete, wood, and steel that contrast with the cool marbled design of the wool-rich rugs. Corridors, punctuated with floor-to-ceiling windows bringing in plenty of natural light, guide guests to their rooms with the help of watery way-finding axminster carpets. Defined by JNS as “urban contextual, stylish yet simple”, the Maven pays a gritty homage to the people that built and continue to enrich the Colorado city. The result, blending history with contemporary Rocky Mountain design, is chic and luxurious but warm and accessible – perfectly Denver. Brintons worked closely with the JNS team through multiple iterations on the hotel’s corridor carpet as well as custom rugs for the suites. Based on our past experiences on several hospitality projects with the company, we looked to the axminster experts at Brintons right out of the gate. We shared our concept and design story with the Brintons team who immediately engaged in our process. Brintons found ways to meet our deadlines and budgets, while making suggestions along the way on how to execute for the best possible result.